During continuous casting (CC) of steel, careful control of the strand cooling and growth of the shell along the CC machine is of great importance. These factors play an important role on the formation of cracks and other defects which can be formed in the cast steel product. To ensure defect free cast steel products, the strand is to be cooled down according to a pattern which depends on steel grade, steel product dimensions, casting speed, and CC machine design. On the other hand, the control of the liquid pool length is a key element in optimizing the casting speed with respect to good productivity. So, the heat transfer plays a very important role in the operation of the CC machines, especially when casting crack sensitive steel grades. In fact, many diverse phenomena simultaneously control the complex sequence of events which govern heat transfer in the CC process. The temperature of liquid steel in the tundish is typically 30 deg C to 50 deg C higher than the liquidus temperature. At the beginning of the continuous casting process, the liquid steel is cooled in a water cooled mould to form a solidified shell which can support the liquid pool at the mould exit. Typical temperature at the end of the mould is1100 deg C and that in the center of the strand is 1550 deg C. Since steel does not solidify at a fixed temperature, but over a range of temperature, there is a mushy region where the steel is neither completely solid nor completely liquid. Steel grades used in continuous casting are completely solid below a temperature ranging from 1350 deg C to 1500 deg C, and the solidification starts at a temperature ranging from 1450 deg C to 1525 deg C. This strongly depends on the content of the alloying elements in the steel. Heat transfer in the solidifying CC steel product occurs in a complex way since the heat to be extracted originates from enthalpy changes in the steel strand both from temperature decreases and phase changes. The former is referred to as sensible heat change and the latter as latent heat. Moreover, phase changes involve not only the changes between solid phases, but also the conditions produced by the solidification of an alloy. For example, a mushy zone exists between the liquidus and solidus temperatures which depend on the carbon content of the steel. In addition, the thermal resistance increases as the steel shell thickness increases from the meniscus to the bottom of the mould. Heat transfer in this region is by conduction. Steel solidification in the continuous casting process starts in the mould, follows in the secondary cooling zones and finishes under air cooling conditions. Casting technology requires very effective heat transfer from the strand surface to the water cooling systems. The occurrence of heat transfer during primary (liquid steel to mould), secondary (sprays zones) and tertiary (free radiation) cooling stages are the main phenomenon connected with the continuous casting of liquid steel. 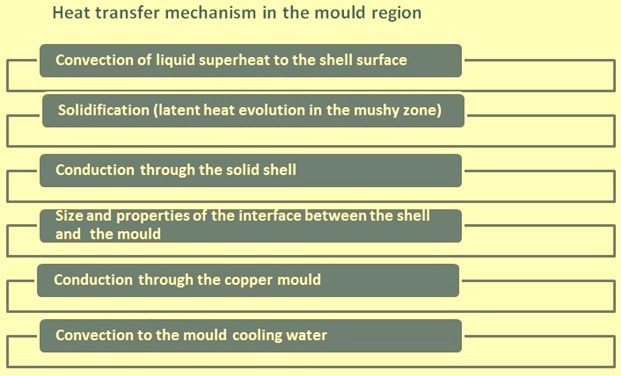 Either the thermal behaviour prediction or determination of such heat transfer systems is important since it directly influences in solidification, especially during the initial stage of the solid shell formation inside the mould. Cooling and solidification in continuous casting occur principally in the sections of mould and secondary cooling. The cooling that takes place in the mould must be sufficient to cool the liquid steel to the point where a solid layer is formed on the surface of sufficient thickness to mechanically support the pool of liquid steel inside the steel shell as it leaves the mould. The secondary cooling process, on the other hand, must be sufficient to complete the solidification process initiated in the mould. The cooling velocity is a critical parameter for other reasons as well since an excessively large cooling rate tends to produce cracks in the bending zone of the cast steel product and an excessively slow cooling rate results in an exceedingly long liquid pool. The processes which influence the heat transfer in the CC process of liquid steel, are conduction and convection in the liquid steel area, conduction in the solidified shell, heat transport between the outer layer of the solidified shell and the mould wall surface, heat conduction in the mould, heat transfer in the mould between the channel walls and the cooling water, heat transfer within the secondary cooling zone by convection and radiation, heat transfer between the solidifying strand and the rolls by conduction. Additionally, the thermal effects related to the phase transformations that accompany the solidification have a significant influence on the heat transfer. The control of heat transfer in the mould and secondary cooling zones plays an essential role in the solidification of liquid steel. The heat exchange limits the casting speed and essentially influences the formation of the solid shell. Heat transfer in the CC mould is critical and is governed by many complex phenomena. Mathematical and computer modeling are typically utilized in developing a greater understanding of the mould thermal conditions, and to aid in proper design and operating practices. The predominant transverse heat transfer can be considered as a flow of heat energy through a series of thermal resistances, from the high temperature source of liquid steel core in the mould to the sink of cooling water of the mould cooling system. The thermal resistances of heat transfer are given below. Heat transfer from steel shell surface to inner copper lining surface is most complex and is the controlling step in the mould. It involves mainly two mechanisms of heat transfer namely (i) conduction, and (ii) radiation. The salient feature of this heat transfer step is the shrinkage of the solidifying steel (which is a function of steel grade and the CC machine operating conditions), and the resulting tendency for an air gap to form between the steel shell and the mould surface. The formation of the air gap is complex and may vary both in the transverse and longitudinal direction. Thus, it has a variable effect on the mechanism of the heat transfer as well as on the magnitude of heat flux. For example, as the air gap is formed, the heat transfer proceeds mainly from conduction to radiation with a resulting decrease in heat flux. In general, this heat transfer step represents the largest thermal resistance of all of the four steps, especially with respect to heat transfer through the copper lining and from the latter to the mould cooling water. The entire pattern of heat removal in the mould is dependent on the dynamics of gap formation. In general, gap width tends to increase with increasing distance from the meniscus as the steel shell solidifies and shrinks away from the mould surface. In addition, as the shell thickness increases with distance from the meniscus, it tends to withstand the opposing bulging effect of the ferrostatic pressure to reduce the gap. After the steel next to the mould surface has been cooled below the solidus temperature, the development of the gap commences. The determination of the actual gap size is difficult due to three factors namely (i) the oscillating movement of the mould, (ii) the cast steel product movement in the mould related to the casting speed, and (iii) the random movement of the cast steel product in the plane that is perpendicular to the casting direction. The presence of mould powder along with gases in the gap is the additional factor, which makes the heat transfer more complex. As a result the thermal resistance in the gap is difficult to be accurately determined. After leaving the mould, the slab surface is cooled with a water spray and in the air. The heat flux that is then carried away from the surface of the cooling down strand is proportional to the temperature difference of the strand surface and the cooling medium temperature. The heat transfer area in the mould may be divided into three zones (i) the zone of direct contact of the liquid steel with the mould walls, (ii) the intermediary zone where a layer of solidified steel appears, and (iii) the zone with the developing air gap. The development of the air gap causes a very high temperature gradient between the solidifying strand shell and the mould wall. The change in the gap parameters has a significant influence on the course of the crystallization process, and constitutes a potential source of disturbances for the stable course of the casting process. Therefore for the evaluation of the stability of the system considered it is vital to get to know the influence of the gap geometry on the thermal operation of the mould. Heat transfer at the copper inner surface is further complicated by the effects of mould lubrication. Another factor influencing heat transfer at this mould surface is the mould taper, which tends to increase heat transfer because it opposes the effect of gap formation. In general, the local heat flux down the mould length reaches a maximum value at or just below the liquid steel meniscus, and decreases down the mould length. The average heat flux for the whole mould increases with increasing casting speed. Heat transfer through copper lining is by conduction. It is dependent on the thermal conductivity of the copper and its thickness; the greater the thickness, the higher the hot?face temperature of the copper lining.Heat transfer from the outer copper lining surface to the mould cooling water is accomplished by forced convection. Although the bulk temperature of the cooling water, typically about 40 deg C, is usually below its saturation temperature at a given water pressure, boiling is still possible at local regions at the mould outer surface if the local temperature of this surface is sufficiently high for water vapour bubbles to nucleate at the surface, pass to the colder bulk cooling water, and condense. This effect increases heat transfer. Nucleate boiling can result in cycling of the temperature field through the copper mould (both at the cold face and the hot face) and can result in the deterioration of the cast steel product quality. Boiling can be suppressed by increasing the water velocity in the cooling system or by raising the water pressure. Incipient boiling is more likely in billet moulds, which have higher cold face temperatures than slab moulds because of their thinner wall thicknesses. Typical values for cold face temperature are in the range of 150 deg C for the billet moulds and 100 deg C for the slab moulds. Control of heat transfer in the mould is accomplished by a forced convection cooling water system, which is normally designed to accommodate the high heat transfer rates that result from the solidification process. In general, the cooling water enters at the mould bottom, passes vertically through a series of parallel water channels located between the outer mould wall and a steel containment jacket, and exits at the top of the mould. The primary control parameters are as follows. The volume of water at the required water temperature, pressure and quality. The flow velocity of water uniformly through the passages around the perimeter of the mould liner. Typically, a pressurized recirculating closed loop system is employed. The rate of water flow is to be sufficient to absorb the heat from the strand without an excessive increase in bulk water temperature. A large increase in temperature can result in a decrease in heat transfer effectiveness and higher mould temperatures. For this same reason, the inlet water temperature to the mould should also not be excessive. Also a proper mould water pressure is required. Higher water pressures tend to suppress boiling but excessively high pressures may cause mechanical mould deformation. Water quality is an important factor with regard to scale deposition on the mould liner. Scale deposition can be a serious problem because it causes an additional thermal resistance at the mould?cooling water interface that increases the mould?wall temperature leading to adverse effects such as vapour generation and a reduction in strength of the copper liner. The type and amount of scale formed is mainly dependent on the temperature and velocity of the cooling water, the cold face temperature of the mould, and the type of water treatment. To achieve the proper flow velocity, the cooling system is designed such that the velocity is high enough to produce an effective heat transfer coefficient at the mould?cooling water interface. Too low a flow velocity produces a higher thermal resistance at this interface, which may lead to boiling and its adverse effects. In general, the higher the cooling water velocity, the lower is the mould temperature. The cooling system is also to be designed to maintain the required flow velocity distribution uniformly around the mould and to maximize the area of the faces that are directly water cooled. Uniform flow distribution can be achieved by the proper geometrical design of the water passages with the use of headers and bale plates. Monitoring the operating parameters of the mould cooling system provides an assessment of the casting process. For example, with a constant cooling water flow rate, the heat removed from a mould face is directly related to the difference between the inlet and outlet water temperature (delta T). Thus an excessively large delta T indicates an abnormally low flow rate for one or more mould faces, whereas an excessively small delta T indicates an abnormally large scale buildup for one or more mould faces. An unequal delta T for opposite faces results from an unsymmetrical pouring stream, mould distortion, or from strand misalignment. Below the mould, the heat transfer occurs by the direct contact of the steel shell with the cooling medium, water, or water air mixture from spray nozzles. The cooling in this section is often referred as the secondary cooling. In this secondary cooling section, heat is extracted due to high pressure of air atomized water sprays, radiation and contact with the back-up and guide rolls. In this zone, heat transfer is characterized by the combined heat transfer coefficient. Here, heat is transferred in all the three modes of the transfer (conduction, convection and radiation). But also the rolls and especially the internally cooled support rolls dissipate much heat from the strand. Where q is total heat flux, K is the heat transfer coefficient, Ts is surface temperature, Tw is the cooling water temperature and qR is radiation heat flux. The major variable influencing the secondary cooling is the surface temperature. The theoretical term ‘Leidenfrost temperature’ has very practical impact on the operation and design of CC machine. Spray cooling efficiency strongly depends on surface temperature. Stable vapour layer can be formed at the cooled surface. The stable vapour layer protects the surface from direct contact to the coolant and the cooling is of low intensity. Stability of the vapour layer is coupled to the surface temperature. When temperature decreases and the vapour layer collapses the cooling instantly grows. The actual surface temperature and the ‘Leidenfrost temperature’ for the relevant casting and secondary cooling conditions can significantly change the intensity of cooling. The Leidenfrost temperature is a theoretical term, which has a very practical impact on continuous casting. There is no existing theoretical method to predict the Leidenfrost temperature. It can be obtained only by measurement. The cooling intensity can be ten times higher in low temperature region in comparison to the intensity in the high temperature region. The border between these two temperature areas is the Leidenfrost temperature. The main heat transfer functions of the spray water system are to provide the following. The proper amount of water to obtain complete solidification under the constraints of the CC operation, i.e., steel grade, casting speed, etc. Auxiliary functions such as cooling of the containment rolls. It is necessary to control both the temperature levels and thermal gradients in the strand to avoid the occurrence of surface and internal defects such as improper shape and cracks. At high temperature, the strength properties of the steel shell play a critical role in the ability of the shell to withstand the external and internal forces that are imposed by the CC operation. The primary forces are those exerted by the ferrostatic pressure of the liquid core and the traction of the withdrawal operation. In particular, the ductility of steel close to the solidus temperature is low and the shell is susceptible to crack formation. It is important to control temperature gradients because thermal strains can be caused which exceed the strength of the steel resulting in cracks. Excessive thermal strains result from changes in the heat extraction rate by either over cooling or under cooling. The latter conditions occurs due to the reheating, which is caused when spray cooling is terminated improperly and the strand reheats by heat transfer from the interior with an increase in temperature before decaying by radiation heat transfer to the environment. Under these conditions, excessive strains and cracks can result. This effect can be reduced by extending and varying the water spray cooling operation to provide a smooth transition with the radiation cooling area. Thus, in the design of a secondary cooling system, the thermal conditions along the strand are to be established which satisfy the product integrity and quality. For example, the surface temperatures along the strand are specified. They are generally in the range of 700 deg C to 1200 deg C. Based on this information, the cooling rates along the strand are determined from heat transfer equations. Important parameters in these calculations include the convection heat transfer coefficient of the water sprays and the water flux (the amount of water per unit area of surface contact). The type of spray nozzle, nozzle position with respect to the strand surface, number of nozzles and water pressure are selected to provide the required water flux and distribution throughout the secondary cooling sector. Multiple nozzles are typically used at each level along the strand that has an overlapping pattern. Generally a series of cooling zones is established along the strand, each of which has the same nozzle configurations and heat transfer characteristics. Since the required cooling rates decrease along the length of the strand, its water flux in successive zones decreases. During operation, changes in the water flux are made to compensate for changes in casting conditions such as casting speed, strand surface temperature, cooling?water temperature and steel grade. Three basic forms of heat transfer namely radiation, conduction and convection occur in the secondary cooling region. Radiation is the predominant form of heat transfer in the upper regions of the secondary cooling chamber and is described by the following equation. Where K is the well-established Stefan-Boltzmann constant, E is emissivity constant, (typically 0.8), A is the surface area, and Ts and Ta are the steel surface and ambient temperatures respectively. As the product passes through the rolls, heat is transferred through the shell as conduction and also through the thickness of the rolls, as a result of the associated contact. This form of heat transfer is described by the Fourier law. For conductive heat transfer through the steel shell, k is the shell’s thermal conductivity, whereas A and delta X are the cross-sectional area and thickness of the steel shell respectively, through which heat is transferred. Ti and To are the shell’s inner and outer surface temperatures, respectively. This form of heat transfer also occurs through the containment rolls. Convection is the heat transfer mechanism that occurs by quickly moving sprayed water droplets or mist from the spray nozzles, penetrating the steam layer next to the steel surface, which then evaporates. This convective mechanism is described mathematically by Newton’s law of cooling by the following equation. where coefficient of heat transfer ‘h’ (a constant) is determined experimentally for selected water fluxes, nozzle types, spray water pressure (and air pressure if air mist is utilized), and finally steel surface temperatures. A is surface area. Ts and Tw are the steel surface and spray water temperatures respectively. Specifically, the secondary cooling heat transfer serves the following functions. The role of the secondary cooling system is to control the thermal state of the strand from the mould exit until its complete solidification. To ensure defect free CC steel products, the strand is to be cooled down according to a pattern which depends on the steel grade, strand size, casting speed, and CC machine design. Typically, large temperature fluctuations are to be avoided as well as high cooling or reheating rates. Surface reheating leads to thermal stresses at the area close to the solidification front, and this may lead, depending on the amount of reheating and the steel grade, to mid-face cracking or hot cracking in general. It is also important that the strand surface temperature at the bending or straightening area is outside the low ductility range of the steel to be cast. If not, there is a risk for surface cracking. From the end of the secondary cooling section to the cut-off section strand is mainly cooled in air by convection and radiation only.